Samsung Galaxy Pop Plus GT-S5570i (aka Galaxy Next Turbo and Galaxy Mini Plus in different parts of the world) is quite different handset in terms of hardware architecture; though it sounds similar to Samsung Galaxy Pop or Galaxy Mini GT-S5570 smart phone and comes with same Android operating system loaded in it. So, one should be careful not to mistake the former with the later one while in the course of flashing or modding their pop plus gt-s5570i smart phone. Whether you have soft bricked your handset and want to recover from that stage or want to manually upgrade you handset with latest android software, you'll have to come across with flashing. Flashing is the process of loading or installing firmwares, roms, update zips, etc. on your handset. This article will, with the help of step by step instructions, guide you on manually loading official Samsung firmwares on your Pop Plus GT-S5570i smartphone. It is recommended that you go through the whole article carefully first before trying the actual procedure. Ok! I got the details. So, what do I have to do next? Before we can install stock Samsung firmware on your galaxy pop plus gt-s5570i, we need few prerequisites which are listed below along with their respective download links. Make sure you've all these in your hand before you proceed to next stage. Odin Multidownloader v1.84: Odin tool is used to flash firmwares on Samsung handsets manually. However, there are different versions of Odin tools for different group of handsets and not all Samsung handsets can be flashed with the help of Odin. You can find more information about Odin at this article. Latest Samsung USB Drivers: These are drivers required for effective communication of your handset with your PC. If you have Samsung Kies installed or have the drivers installed already then, you don't need them. Official Stock Firmware: This is the firmware that you'll be using to flash your pop plus s5570i handset. You can get official firmwares from samfirmware.com. However, please note that firmwares provided at samfirmware for this device can't be used directly with this version of Odin. So, you'll need to use a tool called Odinatrix to decompress those firmware and get Odin flashable files. Please go through the article titled, "How to use Odinatrix to split one package firmware into multiple tar files? ", for more details on how to use this tool and get Odin ready files for the firmware of your region. In this article, however, I'm going to use a JPLC1 firmware for Middle East region. I've got the required files. Anything more? Now, that you've got all required files on your handset, you are ready to proceed with the flashing instructions. Just be sure that you install the drivers on your personal computer and reboot it once before trying out the whole procedure. Also, be sure to read these simple precautions and then proceed accordingly with the flashing instructions provided above. Make sure you extract all the downloaded files with the help of WinZip, Winrar or other similar archive manager program. It is recommended to keep the extracted files in a organized folder for easier access later on during the flashing process. Run the Odin3_v1.84.exe application (you should get a window similar to below). Check Re-Partition, Auto Reboot and F. Reset Time under Option area. Click on PIT button and browse to the folder where you extracted the files and load tassve_0623.pit on it. Click on BOOTLOADER button and then load DefaultCalDataWithBoot_S5570XXXX_REV03.tar.md5 file on it. 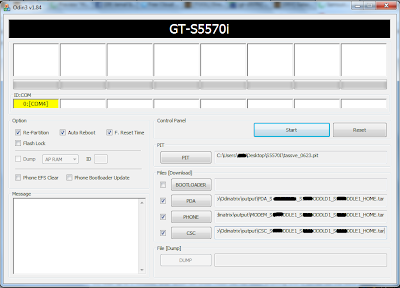 Click on PDA button and load the .tar file with PDA on it's name (PDA_S5570IJPLC1_REV03.tar on our example). Click on CSC button and load the .tar or .tar.md5 file with CSC / CSC-MULTI in it (eg: CSC : GT-S5570I-MULTI-CSC-OJPLC1.tar.md5). Now, that you've configured Odin properly, Power Off your Galaxy Mini/Pop Plus GT-S5570i handset. When your phone is in download mode (a screen with Yellow Triangle and Downloading written on it), connect your phone to your PC. If Odin detects your phone it should says something like 0:[COM4] in one of the boxes on the ID:COM area just above the Options. Then is your turn to press the Start button. Wait for about 5 to 6 minutes till Odin downloads the firmware files on your handset and installs them on respective partitions on your device. After few minutes of patience, you should see PASS written at the top left box. You can then disconnect your galaxy pop/mini plus gt-s5570i from your PC. Below are few things that you need to keep in mind before flashing the rom. You'll not get BOOT file while using Odinatrix to prepare Odin ready files. In that case, you'll have to leave the BOOTLOADER field empty and just load other remaining files. If you are stuck at Samsung logo after flashing the firmware then, you'll need to go to recovery and wipe data and cache and reboot your handset. Be calm during the whole process. Don't rush up (if something unexpected happens) and do something wrong which may worsen the situation. That's all. 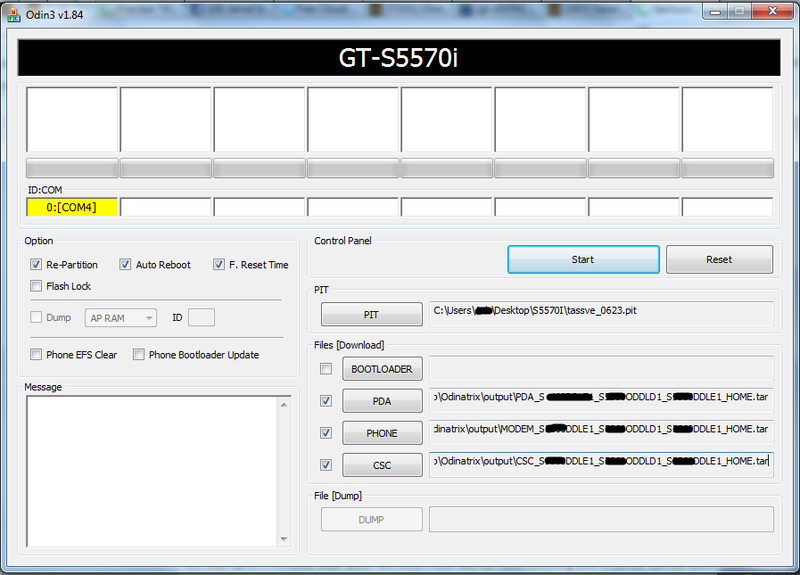 You've successfully flashed your galaxy mini/pop gt-s5570i model with latest stock Samsung firmware. If you are confused with any of the steps above or have any doubts then, please feel free to leave a comment below. I'll try my best to help you with your issue. Good Luck and Happy Flashing!